Maybe, like me, you are one of those people whose shelves groan under the weight of their cookbook collection. 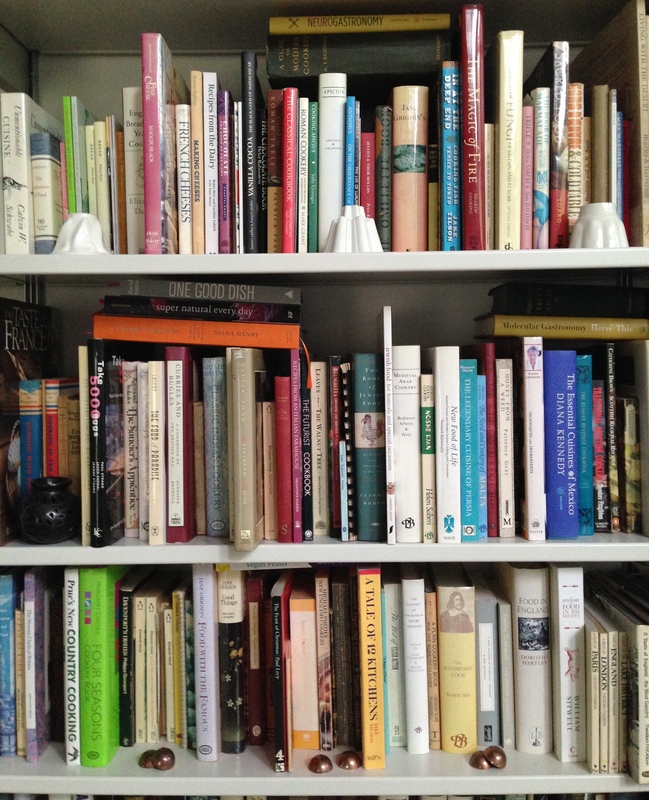 So here’s a question: what do you use all those cookery books for? Easy! To find and compare recipes, to get inspired with new food ideas, to plan and dream about future meals – and to COOK, of course! But for those of us who spend our time thinking about history and culture, reading a cookbook can tell us so much more than just how to cook something. Cookery books are a little window into a cultural moment, giving insight into a particular place or time or group of people. They don’t just tell us about the next dish or the domestic microcosm, but help us think about the place of this slice of the everyday in the wider world beyond. The wonderful writer and mentor-to-many, Barbara Wheaton runs a week-long seminar exploring all the ways to think about cookbooks as historical objects. If you can get yourself to Cambridge, MA in late May/early June, do it: I’ve attended twice, and it’s such an exciting week at the Schlesinger Library (which also has an enviable collection of cookbooks). For 2015 details see this page. Combining what I learned from Barbara with my own work, and adding some actual cooking into the mix, I ran a Metalab seminar on the theme of reading historical cookbooks last year. We talked and read, and cooked and ate, and had a fabulous time. On Friday evening (2nd May 2014), I am repeating the seminar for ‘Leisure’ week at Birkbeck’s pop-up university in Willesden Green, London. Sadly the facilities do not permit us to do any live cooking this time – but if you want to look at some beautiful paintings, read a few bits of cookbook text, and talk about food, history and culture for a couple of hours, then do come along. I might even manage to bring along a little something for you to nibble on while we talk. This session – like all of them in this great initiative – is free, but you do need to register via Eventbrite.